Although Paul Thomas Anderson only made two films in the first decade of the 21st century, he seems likely to top that in the 2010s. After a five-year break, 2012 brought us The Master, and 2014 gave us Inherent Vice. Adapted from a Thomas Pynchon novel, Vice takes us to southern California circa 1970 and introduces us to private detective Larry “Doc” Sportello (Joaquin Phoenix). At the film’s start, his former girlfriend Shasta Fay Hepworth (Katherine Waterston) comes to Doc to get his help. Shasta dates married millionaire Mickey Wolfmann (Eric Roberts), and his wife Sloane (Serena Scott Thomas) boasts her own extramarital relationship with lover Riggs (Andrew Simpson). Shasta suspects Sloane and Riggs plan to kidnap Mickey for monetary purposes and wants Doc to prevent this. Once involved, Doc gets involved in an increasingly bizarre series of circumstances packed with curious characters – and Shasta’s disappearance. Sometimes my plot synopses make movies sound more confusing than they are, while other times these overviews create a sense of narrative logic and coherence that don’t exist. Vice falls firmly in the latter category, as my summary leaves one with a sense that the flick tells a much tighter tale than it does. At its heart, the movie revolves around Shasta and Doc’s feelings for her, though the Shasta role basically acts as MacGuffin. Shasta prompts all of the shenanigans Doc experiences, but the character herself remains somewhat unimportant; she exists to motivate events and not much more. This means Vice goes down a variety of narrative paths without a whole lot of apparent logic to carry the day. I can understand why this becomes off-putting for a lot of viewers, but I think it works. Even without a tight story, the movie throws out so much quirky entertainment that it keeps me involved. Think Chinatown crossed with Big Lebowski and you’ll have some idea what to expect from Vice - though it enjoys a much looser narrative than those predecessors. Actually, I guess you couldn’t call Lebowski a movie with an especially concise plot, but it seems tight as a drum compared with Vice. The rambling nature of the movie’s story seems like the part of Vice takes may deter the most viewers, but it doesn’t bother me. The film is about the journey, not the destination, so the relative lack of coherence doesn’t turn into a problem. Actually, a lot of this makes sense given the drug orientation of Vice. The pacing and stylistic choices tend to reflect the substance related to different segments. This means scenes connected to marijuana work differently than those linked to cocaine. That could turn into an annoying stylistic conceit, but Anderson makes the shifts natural and organic. We don’t ever feel like the movie veers into different tones out of nowhere; it flows in a smooth manner that allows these changes to succeed. It helps that Vice comes with a remarkable cast. While I sometimes find Phoenix to be excessively mannered, he does well as Doc. Phoenix creates the right sense of goofy stoner attitude with his character but doesn’t make him over the top or annoying. The same goes for everything else about Vice. 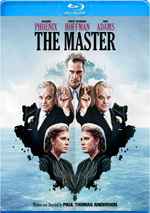 This should be a movie so obsessed with its quirks that it does nothing more than irritate, but it manages to stay on the right side of the ledger. It throws in a mix of small but delightful touches - all of which add to the overall impact – and Anderson stages these in a way that lacks self-consciousness. For instance, the scene in which police officer Christian “Bigfoot” Bjornsen (Josh Brolin) eats a frozen banana delights because it doesn’t call attention to itself. Bigfoot invests in the treat in a manner that could – and probably should – seem lurid, but Brolin plays the segment in such an offhand manner that only amusement results. 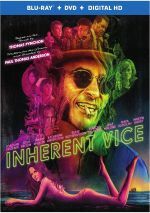 Inherent Vice appears to be a pretty polarizing movie, as its lack of tight narrative puts off many viewers. I fall into the category of those who think the pacing and story development work, however, as they suit the take being told. This ends up as a quirky, non-conventional piece with plenty of entertainment along the way. Inherent Vice appears in an aspect ratio of approximately 1.85:1 on this Blu-ray Disc. The film came with an excellent transfer. Sharpness seemed great. Nary a sliver of softness interfered with the presentation, as it remained well-defined and concise. No signs of shimmering or jaggies occurred, and I saw no edge haloes or print flaws either. To fit its southern California setting, Vice tended toward a broad palette. It went stylized on many occasions but still boasted a wide variety of hues, all of which came across well. Blacks seemed dark and deep, while low-light shots offered positive clarity. Across the board, this turned into a strong presentation. As for the film’s DTS-HD MA 5.1 soundtrack, it seemed competent but not ambitious. Much of the audio remained focused on the front speakers, where we got fairly good stereo music. Effects also spread across the forward channels in a satisfying manner, and the back speakers occasionally contributed decent material, but they tended to reside on the passive side of the street. Audio quality worked fine. Speech seemed concise and distinctive, while music sounded full and dynamic. Effects didn’t tend to have much to do, but they offered appropriate clarity. In the end, the soundtrack seemed satisfactory for the story. The Blu-ray skimps on extras, as we only find four promotional shorts. These include “Los Paranoias” (1:59), “Shasta Fay” (1:11), “The Golden Fang” (2:11) and “Everything In This Dream” (5:49). These offer story/character bits from the film. They’re effective ads but nothing more than that. A second disc provides a DVD copy of Vice. It includes the same four shorts found on the Blu-ray. Disjointed and all over the place, Inherent Vice should’ve been a dud. However, the movie packs so much odd fun and strange character intrigue that it keeps us entertained and occupied across its 148 minutes. 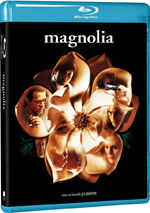 The Blu-ray offers excellent visuals as well as decent audio and minor supplements. Vice won’t be for everyone, but I think it’s so creative that it merits a look.